The GeoAIR opened it's residency program in January 2010. 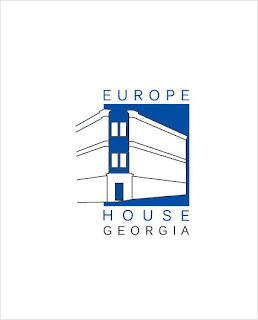 This is a self directed residency program, that offers primarily curators and culture producers the opportunity to base themselves in Tbilisi, Georgia and use this location as a starting point to build networks, meet artists, cultural institutions and curators from the Caucasus region, and develop and deepen their knowledge and research of the Caucasus context. In return local artists, curators and organizations will have the opportunity to extend their knowledge about the innovative ways that many international curators are working. GeoAIR has designated her residency mainly for curators or cultural producers because it feels that they are most able to affect multiplier effects through exchange and production and are more equipped to use the residency as a platform from which to jump for to instigate future collaborations between the resident and artists and organizations form the Caucasus region. Artists' residency and exchange program is important addition to the CCAT platform. Short or long term exchange between artists and curators from Tbilisi and other cities has unique aspect of researching and reacting on environment by artistic expression. At the moment CCAT works on development of long-term cooperation with other artists exchange networks to create new opportunities meeting and exchanging artists and curators internationally. The artists' residency room is a 30 sq. meters including bathroom. Since 2005 the “ARTELI RATCHA” foundation has been successfully organizing and hosting contemporary art workshops in the village of Chkvishi, in the Ratcha region of Georgia. The aim of the “ARTELI RATCHA” project ‘Artists for Ratcha’ is to plan and organize dialogue, master classes and discussions between Georgian and international artists and a local audience. Our initiative aims to stimulate the cultural life of the local population. We would like to help our youth get acquainted with contemporary art through interaction and cooperation with professional artists and art critics. Gala Gallery was established on December 21, 2009 to serve development of contemporary Georgian art. Collection of the gallery contains numerous interesting samples of Georgian paintings of the 20th century. Gala Gallery cooperates with the best representatives of the art scene of the 80ies and 90ies. 3. Exterior and interior design. For exterior design Gala Gallery offers exclusive art objects, which are produced by the Georgian artists. The high level of modern Georgian art deserves recognition both, inside and outside of the country’s borders. Gallery “Vanda” provides the public with relevant information regarding the processes and changes happening in all spheres of Georgian visual art. This is the place where artists of generations old and new meet and share their views and experience and disseminate their work. The gallery cooperates with the best of Georgian artists, whose work is well known both nationally and internationally.Among its other services, the gallery offers a highly qualified consultation to collectors and art admirers and can help compile a corporate or private collection. The gallery Nectar represents an artistic space for contemporary non-mainstream, regional and outsider art in Tbilisi. The gallery situates on 16 Agmashenebeli Ave in midst of small beauty, wedding shops in one of the oldest quarters of Tbilisi near open art market. The gallery is 55 square meters with window doors. Performance basement Nectar is a space below the gallery Nectar dedicated to performance art, film screenings and artistic events. The performance art is a term of broader context combining performative artistic initiatives and contemporary folk performances. 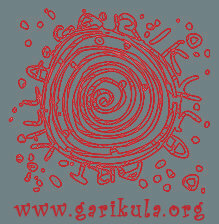 Garikula is driven by the passion to create an environment where artists can live and work together as a team. During a time of change, the desire to cooperate and establish useful contacts becomes stronger, as it allows one to rethink the role of art and the artist in a new world. The artist group involved in Garikula shares a dream: to create in Akhalkalaki a self-sustainingly functioning infrastructure of contemporary art, an art village gathering the people of fine arts and passions to create a universal instrument of understanding, democracy, and balance through elegance. Everyone who believes in the power of art to shape the time in which we live is invited to participate: meetings, workshops and festivals of art gain international scope; the residency project invites people to witness Georgian esthetics of gardening and agriculture, environment history, and art. Garikula plays its role as the regional base where people of art, culture and science can meet each-other and stay in residence. •Discussions on Cultural Policy and strategy. •Projects and exhibitions for development Contemporary Art and cultural dialogue. •Research projects - publications and seminars. Recent successful projects were series of discussions: Rehabilitation strategy of Cultural Heritage in Georgia; Time and environment in Contemporary Art; PR and modern culture - tendencies and problems. held at the Academy of Fine Arts and at the National Parliamentary Library of Georgia and related thematic exhibitions. Urban Reactor is an organization dedicated to improving social and spatial conditions of communities. Currently it is busy with building up "The Library for the built environment studies" which is conceived as an active platform for research, debate and education. among the activities of the library are: selecting and accumulating relevant literature, providing public with translations of key texts important in current Georgian context, organizing reading groups and round table discussions around translated texts, networking of the people active in architecture, planning and activism. Urban Reactor Library is created as a platform for research, debate and education. 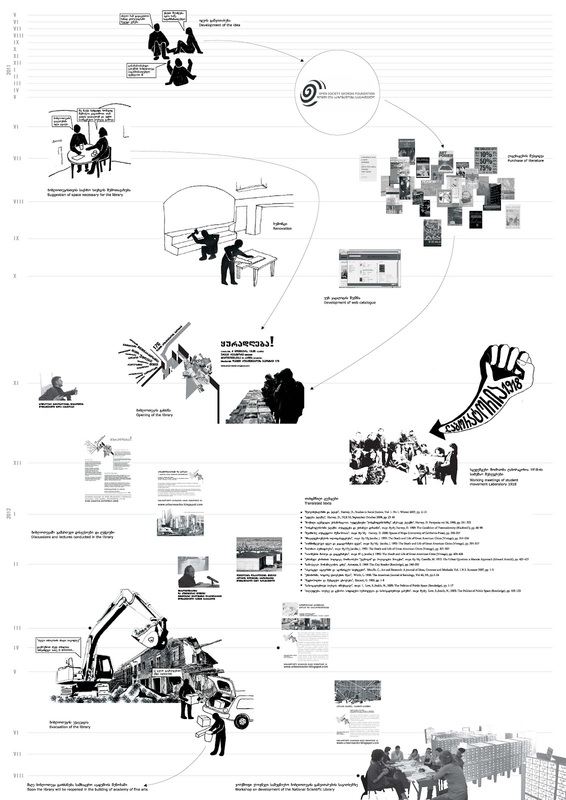 The library consists of the broad range of literature on issues such as architecture, urbanism, contemporaryart, critical theory, sociology, human geography,history etc. 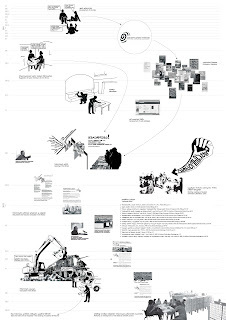 In contrast to the traditional libraries,Urban Reactor library prefers not to stay as a passivecontainer of the information and work towards transmitting ideas that, in its view, are capable to bring the positive changes in our society. Recently Urban Reactor reported about the work done in the library. Below you can see the graphic version of the report. 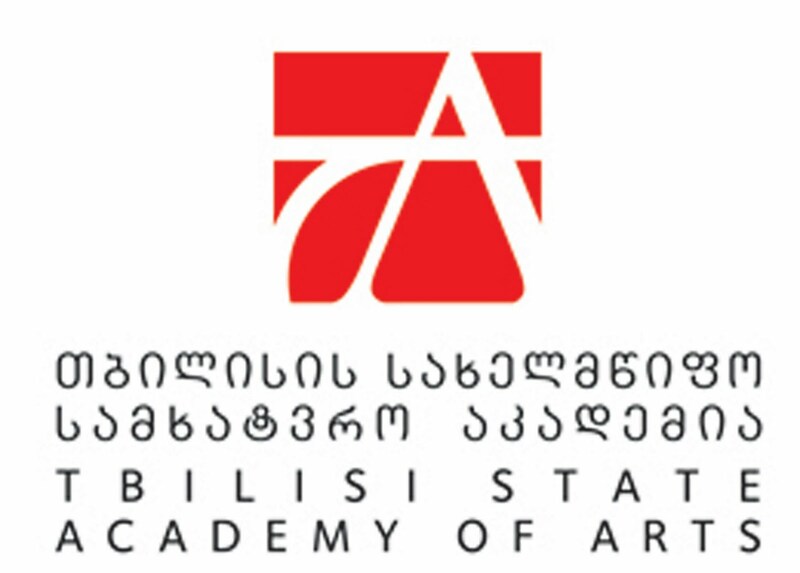 Governmental Institutions: "Tbilisi State Academy of Arts", "Ministry Of Culture And Monument Protection Of Georgia" and "The Georgian contemporary art portal"
year more than 1000 students are enrolled in BA, MA and PhD programs. The TSAA prepares students to become self-aware artists who make a meaningful contribution to society with their innovative passion, experimental attitude and profundity. The ministry is headed by the minister aided by the first deputy minister in charge of Cultural Heritage Strategy, Organizations Coordination and Permissions, and International Programs and Georgian Culture Popularization departments; and three deputies in charge of Administrative, Events and Regional Coordination and Legal departments. Parliament exercises control over the ministry's activities. The budget of the ministry in 2010 was GEL 54,977,500 roughly equal to € 21,991,000. Art.Gov.Ge is the first systematic digital database of Georgian modern and contemporary artists. The main objective of the project is the promotion of Georgian art and artists at the local, regional and international levels. Through this web portal, information about Georgian art will be available for students, artists, professionals and art lovers all over the world. 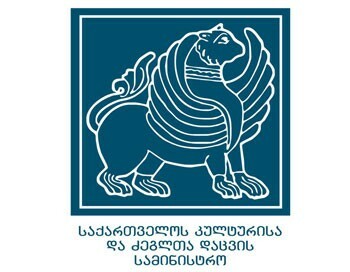 Art.Gov.Ge provides one convenient location where visitors can find information about Georgian artists, art institutions, galleries, exhibition spaces and current events. This website is frequently updated as new artists are added. Under the category of "Artist", you will find the artist's contact information, a description of their work, and in most cases, a thumbnail photo of a sample of their work and a link to the artist's website. The project was initiated and is supported by the Ministry of Culture and Monuments Protection of Georgia in the framework of their ”Modern Fine Arts Development Program”. The partner of the project is Georgian National Museum.